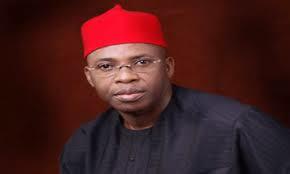 The former governor of Imo state, Ikedi Ohakim has described Governor Rochas Okorocha as a ‘liar’, while revealing why he lost the 2015 governorship election in the state. The former governor, who was reacting to Okorocha’s claim that Imo people hated him and kicked him (Ohakim) out of office, said the governor had lost credibility. Okorocha had also claimed yesterday that Ohakim ran the worst government in the state right from the military regime. But Ohakim, reacting through his Chief Press Secretary, Collins Ughalla, said Okorocha does not like the truth, adding that Imo people like him so much. According to him, “Okorocha does not like the truth. Going by the 2011 governorship election, Imo people loved Ohakim, so much. They voted for him [Ohakim] and he won that election. “Don’t forget that the election was militarized. It also witnessed the kidnapping of the returning officer from Ohaji/Egbema local government, which had 34,000 votes. “Don’t forget Ohaji/Egbema, remains a PDP stronghold and the votes were Ohakim’s votes. The votes from Oguta LGA, remains inconclusive.